Emulate your existing Laserjet, Inkjet printers, or MFP into IPDS printers. Comfy Hotel Reservation assists hotels, apartments, b&b accommodations, motels, guest-houses or holiday homes in managing and maintaining reservations. The system is fully scalable and designed to provide extensive flexibility and varied choices. Hotels and travel agents can achieve maximum time efficiency and best costs in processing reservations. This modern and extremely handy program makes management a real pleasure. The program enables users to switch between profiles to view the reservation of any room, it is also possible to view multiple rooms simultaneously or open the reservations of several rooms at the same time. Comfy Hotel Reservation can maximize yield and minimize unsold room nights for hotels of any size and market orientation. Managing repeat customers and recording customer preferences helps you to retain your customers. All profiles data is protected with a password preventing unauthorized access. The program has the Auto Backup feature that allows saving the data to the secured archive. 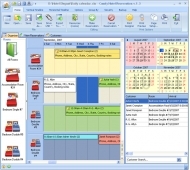 The program also has a built-in Print Designer, which offers a variety of original templates and options to make a fine and clear printout of a schedule. You can save appointments into an iCalendar file with the .ics extension. It facilitates data transfer between applications that use Scheduler and other applications, such as Apple iCal, Google Calendar, Microsoft Exchange Server, Microsoft Office Outlook 2007, Novell GroupWise, Windows Calendar. What is important, the data from Comfy Hotel Reservation can be exported to many different formats, like MS Outlook, iCal, PDF, XML, HTML, XLS and TXT. You pay for the program only the first time and get all new versions of this program for FREE and for a lifetime! PDF splitter software is cost effective tool also provides facility to merge multiple documents together. PDF merge splitter tool reduce the cost of time and money by reducing the work of printing and scanning documents for sending fax one by one. Image to pdf converter converts photos into pdf document, create secure and password protected pdf files from imported JPG, BMP, TIFF, PNG, GIF, PSD, EMF, WMF, TGA etc pictures, transform each pages of TIFF into pdf pages. Standard barcode label software generate any number of barcodes by choosing popular 2D or linear font standard, commonly used size, RGB color, style or shape for various corporate/incorporate industries as well as personal usages in fraction of time.